Rhodes is the largest of the Dodecanese islands. There are plenty of outdoor and scenic activities in the area as well as an abundance of boutique hotels in Rhodes designed to host tourists. Whether you choose to stay at one of the resorts in Rhodes or simply book yourself in at one of the cheap hotels in Rhodes, you will not be disappointed. The strong Greek history of this island is certainly one of its main attractions. There are plenty of ancient sights and beautiful structures to visit and enjoy. The Medieval City walking area is home to a number of historical attractions. Enjoy the feel of the cobble stone beneath your feet as you explore the old structures and indulge in some shopping too. Ancient Rhodes is another fantastic place to lose yourself for an entire day if you choose. The walls house an impressive city filled with shops, restaurants and plenty of souvenir vendors. Visitors can tour the palace and visit the harbour and windmills too. 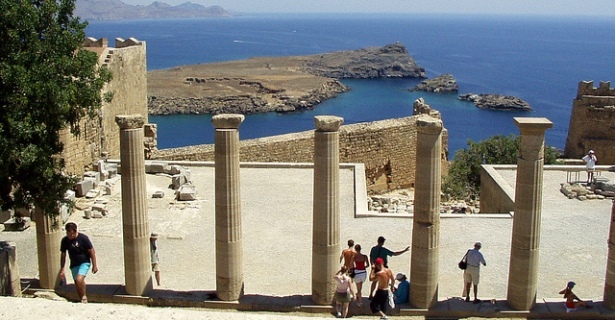 The Acropolis of Lindos and the Archaeological Museum of Rhodes are another two popular historical sites. The Acropolis is a stunning collection of ruins but make sure that you go prepared. The hike to the top can be quite gruelling if you choose not to hire a donkey. Take plenty of water with you and try to negotiate this trip during the cooler hours of the day. As for the museum, it hosts a number of wonderful historical artefacts including the sculpture of Rhodes Aphrodite and a mosaic collection. This museum is definitely a worthwhile visit for the whole family. It’s no secret that Rhodes experiences some fairly hot weather especially during the summer months. If you are booked into one of the luxury hotels in Rhodes, they probably have pool facilities. However, if you want to get away from your hotel or apartment, there’s nothing better than a day at the beach or local water park. Popular beaches include St Pauls Bay, Tsambika Beach and Agathi Beach. The water surrounding the island is crystal clear and the whole family will enjoy splashing around for the day. Alternatively, if you have had enough water fun, you can also take a trip to the Socratous Garden. A gentle stroll here is great for the mind, body and soul. When seeking accommodation in Rhodes, Greece it is best to consider all of your options. Visitors have their choice of anything from apartments in Rhodes to spas, cheap hotel rooms and anything in between. Even the best hotels in Rhodes are extremely reasonably priced. If you want to find where to stay in Rhodes and get the best deals at the best hotels in Rhodes, Greece, however, it is always a good idea to conduct your search and make your booking online in advance.